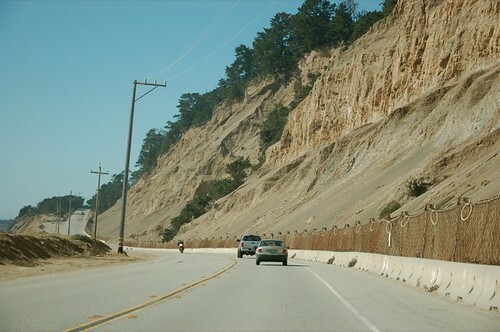 “Driving very carefully, my father kept an eye on the steep and very high cliffs (i.e.Wadell Bluffs) lurking ominously,directly above the highway. — It was quite common for large boulders and rocks to come down from above and land on the road — or worse, on someone’s car. Though from time to time we had to drive around some fallen rocks, a boulder never did crush our car. As we crossed the countyline (Santa Cruz-San Mateo), we would all breathe a sigh of relief. We had made it safely, yet we knew that we had to travel back on that same stretch of highway on our way back home.